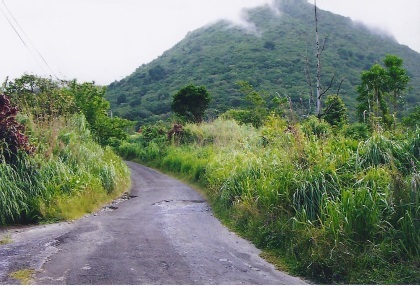 Morne Trois Pitons National Park is a significant area of volcanic activity. Main point is the 1,342m high volcano Morne Trois Pitons ("mountain of three peaks"). Other sights include the Valley of Desolation, a region of boiling mud ponds and small geysers; the Boiling Lake, Titou Gorge, and Emerald Pool. 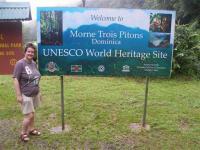 On my first night in Dominica I stayed in the village of Laudat, at the foot of the Morne Trois Pitons National Park. 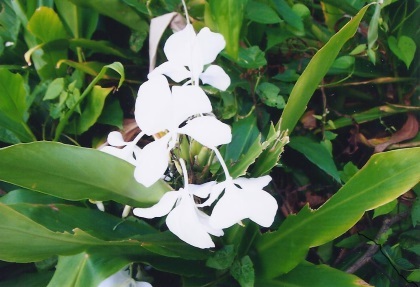 In the evening I enjoyed sitting on the veranda of my hotel, gazing at the green around me and enjoying the silence. 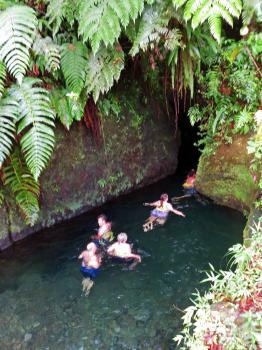 The next day, after a visit to Dominica's colourful capital Roseau, I visited Emerald Pool. This is also part of the worldheritagesite: it's a basin at the bottom of a waterfall in the jungle, with swimming pool quality. Dominica was the island I was most looking forward to on the Caribbean cruise I took last month, not least because of the reviews I'd read of the beauty of Morne Trois Pitons National Park. I had hoped to take a tour which included a hike to Middleham Falls, as well as a journey through Titou Gorge. Unfortunately not enough visitors signed up for that tour, so I went on a tour with a larger group that only included a visit to Titou Gorge in the park. The gorge was as amazing as I heard. The journey started with a short hike through the rainforest, passing poinsettia trees in bloom. The hike turned aquatic upon arriving at the gorge, which was filled waist-deep with brisk, turquoise water flowing from a waterfall we could hear through the rocks and trees. Our party swam through the narrow gorge, stopping to admire the lush vegetation overhead, before we reached the waterfall. And that's where I made the mistake of taking my camera out of my wet bag to attempt more pictures, because I inadvertently allowed water into my wet bag and damaged my camera for the rest of the trip. It was a small price to pay, though, for getting to spend time in the well-preserved natural beauty of a Caribbean isle. Logistics: Tours of Morne Trois Pitons can be arranged through local companies, and are particularly useful for visitors on cruises. Visitors with longer timelines can arrange their own transportation to the park. I visited this site November 2007. The whole island is beautiful, rising steeply out of the sea, and they are very proud of the site - all major sights within it have clear signs with information about what you will see. We visited several different areas, walking through rainforest to see the Emerald Pool, then moving to a much higher altitude to see the Freshwater lake. The greenery there was quite different - you could almost feel you were walking around a lake in the Alps. 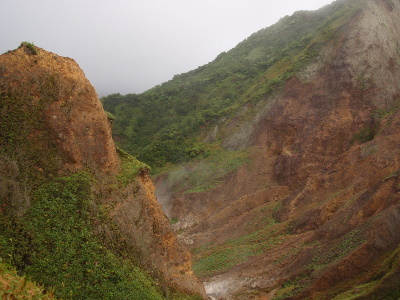 There are clear reminders of the volcanic nature of the park (I think I read that Dominica has one of the highest concentration of volcanoes in the world) - in many places steaming water comes out of the ground and stains the rocks red and yellow. And, to make things even better, we had most of these places to ourselves - mass tourism has NOT reached Dominica. My visit to Morne Trois National Park in 2004 was primarily in the breathtaking Titou Gorge, where we participated in an excursion called the tropical tunnel. This consisted of a half hour bus ride inland from the charming capital of Roseau, to a spot in the mountains where we were given wet suits, helmets, and a harness, then hiked another half hour to the gorge. When we arrived it was like stumbling upon paradise on earth. All was green and waterfalls poured into the gorge at frequent intervals. We slid our way down the narrow chasm dripping with greenery, clambering over slick mossy stones and splashing in the refreshing mountain water for about an hour until we had to climb back up. I figured Dominica would harbor natural beauty but this really took my breath away. The only more paradisaic site I've ever visited would be Fiordland National Park in New Zealand. Next, without a doubt is Titou Gorge. By all means come and see it and bask in its natural glory while enjoying the warmth of the friendly and likeable locals. 56 Community Members have visited.